Become a Reiki Master Teacher in five Reiki lineages. Add 33+ Reiki symbols to your repertoire. Learn how to teach Reiki classes of your own up to the Master Level if you wish. Your Reiki Master certificate will be mailed to you with your name handwritten in calligraphy. The Reiki Master Teacher training is for you if you’re ready to take your Reiki practice to the next level. In the Master course, you find out how to attune others. You exponentially deepen your Reiki knowledge, skills and technique. You also become attuned to all the Reiki symbols I know, including the Reiki Master Healing Symbol, the Tibetan Master Symbol and two DNA symbols. This advanced Master level class includes a recorded sound healing session from Christo Pellani, one of the top sound healers in the world. You also get to experience your Reiki Master attunement directly from the one-and-only Sedona, AZ. Sign up for my free Reiki newsletter to find out when the Reiki Master Teacher video course is ready! Learn how to give a complete Animal Reiki treatment, work with animal spirit medicine and communicate telepathically with animals in my most popular class! Read information about upcoming retreats and see pictures and itineraries from previous retreats. Become a Reiki practitioner today! Receive your Reiki attunement, learn how to send this powerful healing energy and much, much more. I have take the level I and II and I have my certificates. How can I take the Master Level on line course you offer. Do you need me to send you copies as well of my certificates. Thank you. But when the Master Class is ready, I would like to see copies of your certificates if you have them. But if you didn’t, that wouldn’t be a problem, I would take your word for it that you’ve already taken Reiki I and II. Thanks for your question, Patricia! 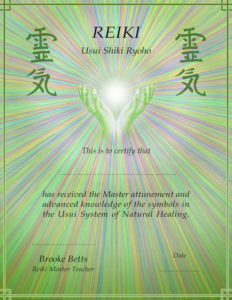 I have been attuned to level 2 Usui Reiki all within this year. I am ready for the next step, Master! I am very interested in your online training! If I understand right, this will be 8 weeks, 1 hour each time we meet on skype? Would you be willing to spend more hours per session to end in less than 8 weeks? When is the soonest we could start? What happens if I have something come up and need to reschedule a date? A conflict in scheduling? You seem to have such great energy, I can feel it through your email! I normally wouldn’t say that because it might sound too “out there”, but we are dealing with energywork and Reiki after all. I am going to send you a private email though, I think that we can work something out. Perhaps you can go through my online video classes as a “tester” so to speak. Writing you an email now! i would love to learn to become a certified reiki master. i have not completed reiki I & II. Would i have to complete those two before doing The Reiki Master Course? Also is this a recognized course in Australia? I think that’s so great that you want to become a certified Reiki Master! Regardless of whether you become a Reiki Master because you want to teach and attune others or if you’re just doing it to further your own spiritual healing and development doesn’t really matter. I actually never planned on teaching Reiki, I just wanted to use it to heal myself, but life had other ideas apparently! To answer your questions, yes, you would want to take the Reiki I and Reiki II courses before you can take the Reiki Master Class. You’d want to do this for a couple reasons. One, the Reiki levels (Level I, II and the Master Level) really do build upon each other. You also receive a Reiki attunement (kind of like an initiation or a ceremony introducing you to the Reiki energy) for each level. So you’d want all three attunements before becoming a Reiki Master. For example, in Reiki I you learn how to give a complete Reiki session to yourself and to another person. We can also talk about Reiki for Animals if that’s something you’re interested in. In Reiki II, you learn additional Reiki symbols, and you also learn how to send Reiki long distance, back into the past and forward into the future. We also go into the chakras in detail, talk about protecting yourself from unwanted energies, how to use a Reiki pendulum in your sessions, how to manifest with Reiki, and so on. In the Reiki Master Course, you learn about 33 new Reiki symbols, and we also really talk about how to attune other people and teach Reiki classes of your own if you so desire. Secondly, it’s kind of nice to go through the classes one at a time so you really get to take in and process everything that you’re learning. After each Reiki attunement, you go through a restructuring of your energy for a few weeks afterward, as you adjust to being able to hold more healing Reiki light energy in your body. Basically, you’re becoming a better channel for the Reiki energy with each attunement. The journey of Reiki is definitely one of self-healing above all else, a spiritual healing practice you do to honor your soul and your true nature, so it’s nice to learn it a little more gradually. Also, if you plan to teach classes, it’s nice to have personal experiences of your own that you can add into the classes, which often come over time. As far as this being a recognized Reiki course in Australia, honestly there isn’t really one organization who monitors or evaluates Reiki classes around the world as far as I’m aware of. The online Reiki classes I teach are certified, and you do receive Reiki certificates for each level. But in America at least, there isn’t a board or anything that ‘recognizes’ a Reiki training program as official. Hope that answers your questions! I would love to attune you to Reiki if that is the right decision for you, I know how much it has really helped me in my life. If you buy the Reiki I, II and Master Classes all together (and you can wait until after a couple of our Reiki I classes to make sure it’s a great fit), the price is $700. Otherwise, if you buy the Reiki courses separately, the price is $800 I believe. Take care, Cheyenne, and I hope to “see” you in a Reiki class soon! No, you definitely don’t! I would be happy to attune you to the Reiki Master Level as long as you’ve already taken Reiki I and Reiki II elsewhere. I would want to go over what I personally cover in those online classes with you, just to make sure that we are on the same page, especially since I would be attuning you to the Master Level. I would also want to make sure that you have already been attuned to certain Reiki symbols and so forth. But I bet it wouldn’t be a problem at all! Hi there. I’m interested in becoming a certified Reiki Master. I’d like to possibly join the Sedona trip this year but would like more information on dates and prices. Also, why is it that you aren’t able to do level III as well on the retreat? Would I need to come home and do the online master course? We haven’t quite figured out the dates and prices for this year’s upcoming Sedona Reiki Retreat. The 2014 Retreat was a full seven days, but this year I think we might have it from Thurs-Sun, since a lot of people wanted to go, but taking off a full week was just too much for them. The price will probably be around $1200 – which will include lodging, all meals, Reiki I and II certification and training, yoga classes, sound healing, hikes and more – but we are definitely still figuring it all out! We are having a Reiki I retreat in Carlsbad, CA (near San Diego) in April as well, which will be a Fri-Sun and will probably be around $750. The best way to let you know about exact dates and prices would be for you to sign up for the Reiki Training Classes newsletter, since we’ll tell everyone about early bird discounts and special rates and everything. Also, your question about why you can’t do the Master Level on the retreat is a great one! We structured it that way, because, honestly, being a Reiki Master is something that I don’t think a person can really learn in one week. I think people have to experience Reiki, practice it on themselves and other people, go through the detoxification process that often happens after an attunement, and really just feel the Reiki energy flowing through them. So I think it would be too much to do all in one week, but you actually gave me a great idea – why not have a Reiki Master Training Retreat in Sedona! It would be for students who are already Level 1 and 2 practitioners who are ready to become masters. We could have it a few months after the Reiki I & II retreat, and of course people could always do the online Master Course if that worked out better for them. Take care, if you have any other questions, please feel free to ask! I just wanted to know how long is the online reiki master class? im very interested in trying out the online class. Thank you. Pretty name! Let’s see, the Reiki Master class training usually lasts about eight weeks, and we meet once a week for an hour over Skype for a total of eight sessions. However, I really want people in the Master class to feel comfortable attuning other people and also teaching their own Reiki classes if they so desire, so if need be we have held an extra class or two, just to make sure! Also, regarding the prerequisites for the Master class of Reiki I and II (which don’t have to be taken with me), I also go over the “Reiki basics” just to make sure that we’re on the same page when it comes to those first two classes. I’m sure you would be fine as long as you know the basics, like The Power Symbol, The Mental Emotional Symbol, the Distance Healing Symbol, etc. As long as you know those and also how to give a Reiki treatment to another person, that’s just fine. I would also want to send you my Reiki I and II manuals, so that you would know what I cover in those classes and so you would have an idea of how you could structure your own Reiki I & II trainings if teaching is something you want to do. So, yes, if you took the Reiki Master Class, I would attune you to all the symbols I know (except for one that is personal for me right now! : ), including three versions of the Reiki Master Symbol. You would also learn how to give attunements all the way up to the Reiki Master level, and we would also talk about creating your own classes if you were interested in that. Also, if you haven’t really studied Animal Reiki, we would go over that as well.